The performance of gas without the noise, mess and fumes. The EGO 56 Volt POWER+ Lawn Mower delivers long-lasting power, easy push-button start and durability in all-weather conditions. The advanced 5.0 Ah 56 Volt Li-Ion battery uses industry-leading Arc-Lithium technology to deliver Power Beyond Belief and is compatible with all EGO POWER+ products. Offering the torque of gas without the noise, mess and fumes, the EGO 56V Li-Ion Mower delivers long-lasting power, rapid charging and durability in all-weather conditions. With up to 60 minutes of cut time, this mower tackles even the toughest of mowing applications. The advanced EGO POWER+ 56V battery (shipped separately) uses industry-leading Arc-Lithium technology to deliver superior power and is compatible with all EGO POWER+ products. The Jonsered L2821 21-inch self-propelled front wheel drive lawn mower delivers superior mulching, bagging, and discharge performance. Powered by a 160cc Honda GCV160 engine, with 6.9 ft.-lbs. gross torque. Featuring dual trigger, variable speed controls; quick height adjustment; and high rear wheels, the Jonsered L2821 provides power, maneuverability, and ease of use to get the job done. The Jonsered L4621 21-inch self-propelled all wheel drive lawn mower can handle tough terrain with ease. Equipped with the 7.75 ft-lb Kohler XTX engine, the Jonsered L4621 also features a premium, high-tunnel cutting deck for superior mulching, bagging, and discharge performance. Featuring dual trigger, variable speed controls; quick height adjustment; and high rear wheels, the Jonsered L4621 provides power, maneuverability, and ease of use to get the job done. 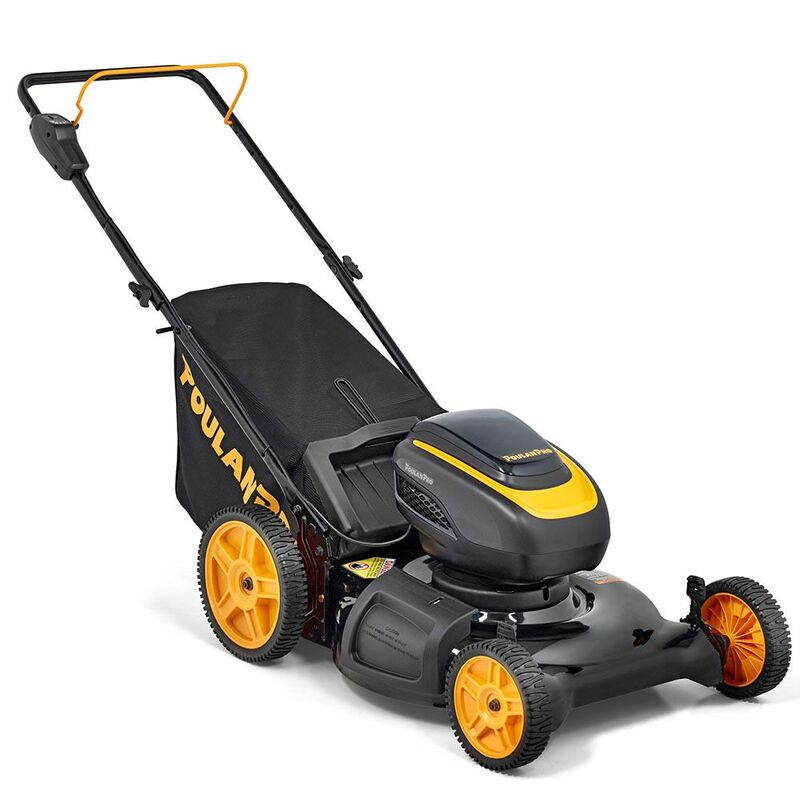 3-in-1 58V Cordless Push Lawn Mower 21 inch, PRLM21i For the homeowner who's not interested in handling or storing fuel, dealing with exhaust, or fumbling with cumbersome power cords, the all-new hassle-free Poulan Pro PRLM21i battery-powered lawn mower is the ultimate solution. Powered by a 58V lithium-ion rechargeable battery, it features instant push-button starting and provides the power and performance typical of gas-powered push mowers, without all the noise and harmful exhaust. The 21-inch steel cutting deck is capable of side-discharging, mulching, and bagging. It has five cutting height positions, and over-sized 11-inch high rear wheels for easy manoeuvring. With a built-in battery power meter, it's easy to monitor power usage, and the handle-mounted, easy-to-view battery power indicator guarantees you'll never run out of power mid-task. This quiet, lightweight, ergonomically designed, and environmentally friendly mower is powerful, easy to start, easy to operate, and perfect for small yards and homes with close neighbours.